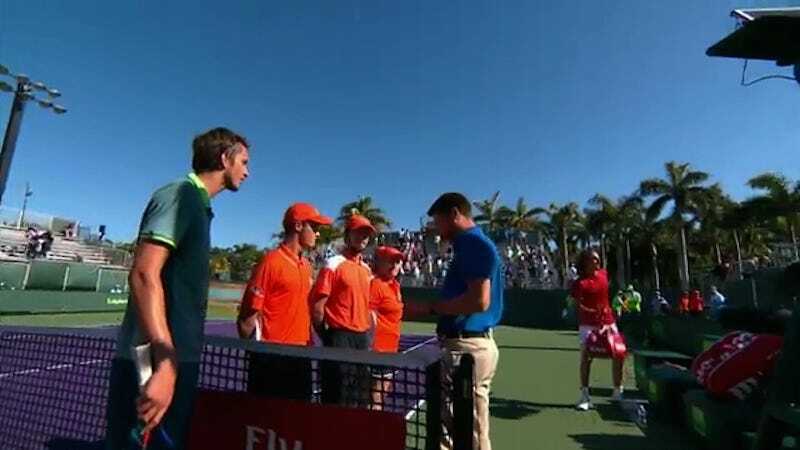 Daniil Medvedev, best known for melting down and tossing money at an umpire at Wimbledon last year, got into a tense battle of toilet breaks and unwritten rules today as he defeated Stefanos Tsitsipas 2-6, 6-4, 6-2 at the Miami Open. The 22-year-old Medvedev took a emergency toilet break in the second set, while the 19-year-old Tsitsipas took a shorter one during the third. When the match resumed, one of Tsitsipas’s shots glanced off the net cord, and he ended up winning that point. It’s considered proper etiquette to apologize for being the beneficiary of a fluke like that. When Tsitsipas didn’t, Medvedev fumed. “Say sorry, man,” the Russian demanded. Tsitsipas’s remark isn’t audible in the video, but Medvedev’s claim wasn’t rejected. If anything, the umpire seemed to sympathize with the Russian’s situation. Medvedev can try to put the toilet feud behind him and get ready for his next match Saturday against No. 4 Sascha Zverev.